A selection of gemstone pebbles made by tumbling rough rock with abrasive grit, in a rotating drum. The biggest pebble here is 40 millimeters long (1.6 inches). A gemstone is a mineral, rock, or petrified organic matter that, when cut or faceted and polished, is collectible or can be used in jewelry and decorative items. Among the most highly valued gemstones are diamonds, emeralds, rubies, and sapphires. Some gems (such as single-crystal rhodochrosite) are too soft or fragile to be used in jewelry, but they are often exhibited in museums and sought by collectors. Various gemstones also have practical value—for instance, to make abrasives and generate laser beams. A number of them are now being produced by artificial processes. On account of their monetary value and aesthetic appeal, gemstones have also been sought by thieves and warriors, fueling violence and causing people to suffer. Gemstones are made of various materials. Most gemstones are minerals, which means they are naturally occurring, inorganic materials, each with a particular chemical composition and crystalline structure. In terms of chemical composition, the largest group of gemstones consists of silicates, and the second largest group consists of oxides. For instance, emerald is a silicate of beryllium and aluminum (Be3Al2(SiO3)6, or beryl), and rubies and sapphires are composed of aluminum oxide (Al2O3, or corundum). Diamonds, however, are a crystalline form of carbon (C). For a material to take a crystalline form, its molecules (or atoms or ions) are packed in regularly ordered patterns (with names such as cubic, trigonal, and monoclinic). Some crystals exhibit a property called twinning, in which two crystals intergrow and share some of their lattice points. Some gemstones, such as lapis lazuli, are classified as rock—that is, they are composed of mixtures of minerals. Others are made of organic matter. For example, pearl is produced by oysters, amber corresponds to a fossilized tree resin, and jet is a form of coal. If a gemstone is mainly made of a single mineral but contains small but visible quantities of a different mineral or fossil, those "flaws" are known as inclusions. Characteristics of gems include their optical properties such as luster, luminescence (low-temperature emission of light), dispersion of light (separation of different wavelengths of light), refractive index (ratio of the speed of light in the material to that in a vacuum), and absorption spectrum (wavelengths of light absorbed by the material). In addition, gemstones are characterized by their physical properties such as specific gravity (density), hardness (resistance to scratching), type of cleavage (splitting of crystals along definite planes), and fracture (breakage of the material without separation of the parts). Gemologists classify gemstones based on their chemical composition and crystal structure. According to one system of classification, a specific type of gem is considered a variety that is part of a certain species and group. For example, ruby is the red variety of the species corundum that belongs to the spinel group. Emerald (green), aquamarine (blue), bixbite (red), goshenite (colorless), heliodor (yellow), and morganite (pink) are all varieties of the mineral species beryl. Gemologists also use the term "crystal habit," which is the outward shape the gem is usually found in. The outward shape is often not the same as the inner, invisible "crystal system." For example, diamonds, which have a cubic crystal system, are often found as octahedrons. 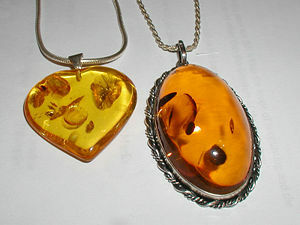 Jewelry made with the gem amber. The value of a gemstone is usually based on its visual attractiveness, rarity, durability, size, and shape. Characteristics that make a stone beautiful include its color and any unusual optical phenomena. In addition, the stone is cut in ways that enhance its optical features. The art of cutting and polishing gemstones is one of the lapidary arts. Usually, the less the number of imperfections in a stone, the more valuable it is considered. Sometimes, however, the presence of an interesting inclusion will increase the stone's value. Diamond is highly prized as a gemstone because it is the hardest naturally occurring substance known and, when faceted, can reflect light with fire and sparkle. Diamonds, however, are far from rare, as millions of carats are mined each year. Traditionally, common gemstones were grouped as precious stones (cardinal gems) and semi-precious stones. The former category was largely determined by rarity and a history of ecclesiastical, devotional, or ceremonial use. Only five types of gemstones were considered precious: diamond, ruby, sapphire, emerald, and amethyst. Currently, gemologists consider all gems as precious, although four of the five original "cardinal gems" are usually (but not always) regarded as the most valuable. The value of amethyst has dropped ever since huge quantities were discovered in Brazil and other parts of the world. Some gemstones are so rare and unusual that that they are scarcely known except to connoisseurs. They include andalusite, axinite, cassiterite, clinohumite, and iolite. Various gemstones also have practical value, and a number of them are now made by artificial processes (see Synthetic and artificial gemstones below). For example, diamonds are excellent abrasives and are used for cutting, drilling, engraving, grinding, and polishing. Likewise, garnet sand is a good abrasive and may be used instead of silica sand in sand blasting. Obsidian (a naturally occurring glass) is used in cardiac surgery because an obsidian blade can be made much sharper than a high-quality steel surgical scalpel. Synthetic sapphires with small amounts of chromium or titanium are used to generate lasers. In the past, jade was used to make knives and weapons, and lapis lazuli was powdered and converted into the pigment ultramarine. Some gemstones are manufactured to imitate others. For example, cubic zirconia is a synthetic diamond simulant, composed of zirconium oxide. Such imitations copy the look and color of the real stone but possess different chemical and physical characteristics. True synthetic gemstones, however, are not necessarily imitation. For example, diamonds, rubies, sapphires, and emeralds have been manufactured in laboratories, with chemical and physical properties that are very nearly identical to those of the genuine stones. Synthetic corundum stones, including ruby and sapphire, are quite common and cost only a fraction of the natural stones. Smaller synthetic diamonds have been manufactured in large quantities as industrial abrasives for many years. Only recently, larger synthetic diamonds of gemstone quality, especially of the colored variety, have been manufactured. In the United States, the Federal Trade Commission (FTC) has strict guidelines about labeling artificially produced gemstones. According to the FTC, such stones need to be clearly described with such terms as "synthetic," "imitation," "laboratory-created," and so forth. In addition, the created stone may not be given the name of a particular gemstone unless it has "essentially the same optical, physical, and chemical properties as the stone named." 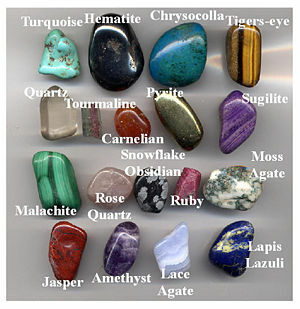 Gemstones have been known and valued throughout history. Many have been associated with symbolic significance as well as material wealth and power. For instance, in early Indian culture, diamonds were associated with the gods and were used to decorate idols. In traditional Islamic cultures, an agate ring was thought to offer protection from mishaps and victory over one's enemies. Jade was the royal gem in early Chinese culture; while lapis lazuli was highly prized by the pharaohs of ancient Egypt. In various cultural traditions, specific gemstones were thought to have the power to heal physical and mental illnesses. For example, agate was thought to prevent disease and soothe the mind, as well as to cure scorpion stings and snakebites. Emerald was used as a cure for epilepsy and dysentery, garnet was used as an insect repellent, and lapis lazuli was thought to keep the limbs healthy and free the soul from error. In addition, emerald and garnet stones were thought to have the power to ward off evil spirits. In Western culture, the diamond has traditionally been taken to symbolize virtue and fearlessness, and garnet has been a symbol of faith and trust. Amethyst, a symbol of heavenly understanding, has been worn by the person who pioneers the spiritual and material realms. Today, the diamond is taken as symbolic of eternity and love. Moreover, various gemstones continue to be associated with calendar months, zodiac signs, and days of the week (see Birthstones, zodiac stones, and birthday stones below). There are over 130 species of minerals that have been cut into gems. Of these, some of the common ones are listed below. A birthstone is a gemstone culturally associated with the month of a person's birth. Different cultures have historically used many different sets of birthstones. In 1912, Jewelers of America, a national association of jewelers in the United States, officially adopted the following list, which is currently the most widely used list in the United States and many other countries. December: turquoise, lapis lazuli, zircon, or blue topaz. In 2002, the American Gem Trade Association added tanzanite to December. An astrological version of birthstones uses the 12 zodiac signs instead of the 12 calendar months. Listed below are the birthstones associated with dates for the tropical Sun signs. A number of gemstones have gained fame because of their size and beauty or because of the people who owned or wore them. A partial list of famous gemstones follows. ↑ USGS, Gemstones: Statistics and Information Retrieved August 24, 2015. ↑ Office of the Federal Register (U.S.), Code of Federal Regulations, Title 16, Commercial Practices, Pt. 0-999, Revised as of January 1, 2014 (Office of the Federal Register, 2014, ISBN 0160922496). Weinstein, Michael. The World of Jewel Stones. New York: Sheridan House, 1958. This page was last modified on 25 May 2017, at 16:22.